aging-in-place! Through the gate and pavaillion, the yellow house awaits! My house is the second from left. The first, its garage, and the third house are now lost from fire. Goodrich “street” was named after Aaron Goodrich, a chief justice of the territorial supreme court, 1849-51. 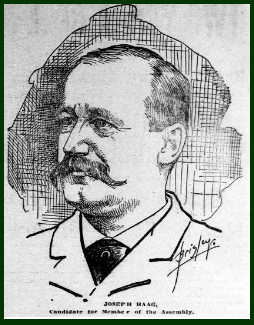 Leech Street was named after Gen Samuel Leech, a receiver of the United States land office established at St. Croix Falls, Wisconsin. The Haag family immigrated from Württemberg in 1856. (There’s lots of Württemberg immigrants in the West End). Valentine was born in 1824 and his wife Anna in 1929. Their oldest son Andrew was born in 1851 and son Joseph in 1852 (died 1915). Valentine, a wood dealer, lived at 88 Leech, then numbered 13 McBoal, with his wife Anna/Annie, and four more children: Theresa (dress maker), George (tinsmith), Ann and Eda. Their original 1857 homestead still stands near the alley to the rear of 88 Leech, where it is currently used as a shed. Joseph ’s wife Frances immigrated in 1855 from Württemberg. In the 1880 Census they lived at 69 von Minden (Michigan Street) with two children, William P and baby Josephine A. Joseph’s brother Andrew and his wife, Annie, and their baby Mary L also lived with them. According to building permits, in 1886 Lauer Brothers built two houses for Joseph and Frances Haag at 112 Leech Street and 169 Goodrich down the street from the father Valentine’s family. An early map of Goodrich-Leech shows a similar house to 169, facing west at 112 leech that may have been moved to face south, but property records do not indicate a “move”. The Joseph Haags then raised five children in their 112 Leech street home, and according to the St. Paul Globe were still in residence in 1904. Joseph Haag died in 1915. In 1900 George and Emile Graff and their two daughters lived at 169 Goodrich, and in 1910 an Irish family, David and Bridget Hurley and their three daughters and one granddaughter and eight(!) 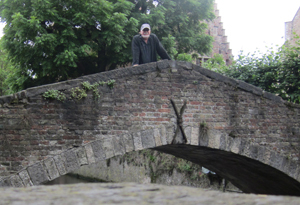 lodgers lived at 169. Oakland Cemetery Association records indicate in 1918 Anthony Herbeck (1878-1918,), a barber, died of pulmonary tuberculosis while residing at 169 Goodrich with his wife Sophia (Schwer) and son Jerome. Anthony immigrated from Germany in 1882 at the age of four. Prior to living on Goodrich, the Herbeck family lived at 283 Cliff Street with Sophia’s brother and mother (who immigrated in 1860 from Germany). Michele/Mike D’Andrea/Dandrea immigrated from Italy in 1913 and his wife Concetta Mansi in 1920. Their son Frank was born in 1922, daughter Mary a year later. The family first resided at 169 Goodrich in the 1930 census when Mike is at work on “steam engines”. Baby son Gaetano joins the family that year, then another son Mike, Jr.
Gaetano D’Andrea/Danrea, Mike, Sr.’s brother, and his wife Rosa immigrated from Italy in 1904 and 1909 respectively and lived at 394 Mill Street along the river in Little Italy. Gaetano also worked for the railroad in steam engines. They had three children in the 1930 Census, Pasquale, Louisa, and Frank. East of 169 Goodrich, 161 Goodrich was built before 1886 but razed in 1971. Martha Aegerter (1886-1964) was born in Elgin, Fayette County, Iowa and married James McEvoy (1874–1935) in 1912. In 1930 she lives at 161 Goodrich without her husband but with two teenage daughters. She does housework for a private family, and in 1940 lives alone but with a roomer, William Hodges. West of 169 Goodrich, at 118 Leech Street, in 1930 Italians Nick and Josephine DeRosa/Derosa, who immigrated in 1907 from Italy, and their eleven American-born children live next door with an Italian boarder John Minore who works for the railroad. Nick works at a stone yard, one daughter works as a meat “packer” and one a dish washer at a hotel. 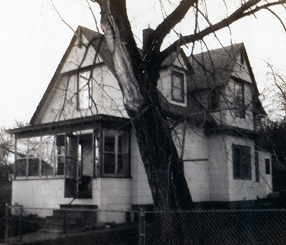 118 Leech Street was razed in 1973. 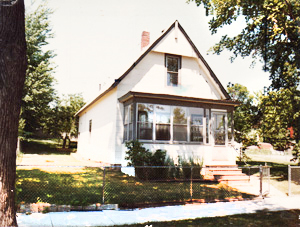 The current yellow house was built in the 1950’s, occupied then by sisters Lorraine (1926-2009) and Velma (1923-99) Harrington of Brainerd. They were relocated from their Irvine Park apartment and used their relocation money to buy their house. 1979: The picture above was a "sales" photo when I bought the house. There were two layers of siding, asphalt and asbestos, hiding the original beautiful clapboard and wood trim that I was unaware of when I bought the house. Generally a neo-gothic, Victorian stick style home is constructed of wood; and is angular, asymmetrical, vertical and has a lot of detailing! This style originated with Andrew Jackson Downing (1815 –52) and house pattern books of the 1860s and 1870s. Downing also founded the magazine “Horticulturist” and was known for his garden and park design. 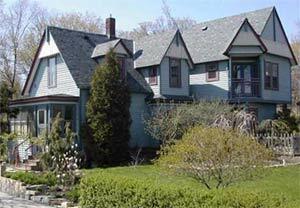 A representative of the Victorian Stick Style, my house features this typical gabled, steeply pitched roof with overhangs. The house has lost its original wrap-around porch, first floor tall windows, and southwest bay. Arguably the house could also represent the Eastlake Style--with its gable ends and porch posts covered with decorative cutout patterns, drilled holes, jigsaw and lathe work in wood. 1982: first addition built to the east; deck added. 1991: Renovate first floor with new walls, baseboards, arches, refinish floors. 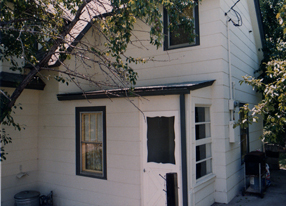 1998: Removed asbestos siding from garage and added trim to compliment that of the house. 1998: Build cupola above garage with weathervane. 1999-2000: Built garden house south on garage. 2002: Timber frame 18 x 25 addition (the great room) to the north; remedied wood and structural rot on the back of the house dating from the 1880's at base from slope. 2012: Steve and three whippets join the household. 2016: Install reclaimed old-growth white pine flooring in the great room as well as develop an extension of the kitchen into the basement while refinishing its stairwell. 2017: Building an addition on the house next door!